There is a lot of bad stuff that happens in Ether 13-15, and it is not very fun to read about. The prophet Ether told the Jaredite king, Coriantumr, that his people would be destroyed because of their wickedness, and he admonished Coriantumr and his people to repent. When they refused to repent, war and wickedness escalated for many years until the entire Jaredite nation was destroyed. Only Ether and Coriantumr survived to witness the fulfillment of Ether’s prophecy. If you watch this short film about the last battle of Coriantumr and Shiz, you will notice a scriptural content error at the end. Understandably, it was most likely an intentional artistic edit to increase the drama of the already dramatic battle. The prophet Ether’s record of the Jaredite civilization serves as a witness that those who reject the Lord and His prophets will never prosper. These chapters are also a fulfillment of God’s decree that “whatsoever nation shall possess [the land of promise] shall serve God, or they shall be swept off” (Ether 2:9). However, what I would like to focus on in these chapters is something that is great to learn about–NEW JERUSALEM (Ether 13:1-12). I love to learn and teach about New Jerusalem! The place where the Saints will gather and Christ will personally reign with them during the Millennium. Zion (the New Jerusalem) will be built upon the American continent, and the earth will be renewed and receive its paradisiacal glory (A of F 1:10). It also refers to a holy city that will come down out of heaven at the beginning of the Millennium. New Jerusalem is mentioned in each of the books of scripture used by The Church of Jesus Christ of Latter-day Saints–Old Testament, New Testament, Book of Mormon, Doctrine and Covenants, and the Pearl of Great Price. In order to get a good understanding of New Jerusalem it is important to see what each book teaches about this holy city. 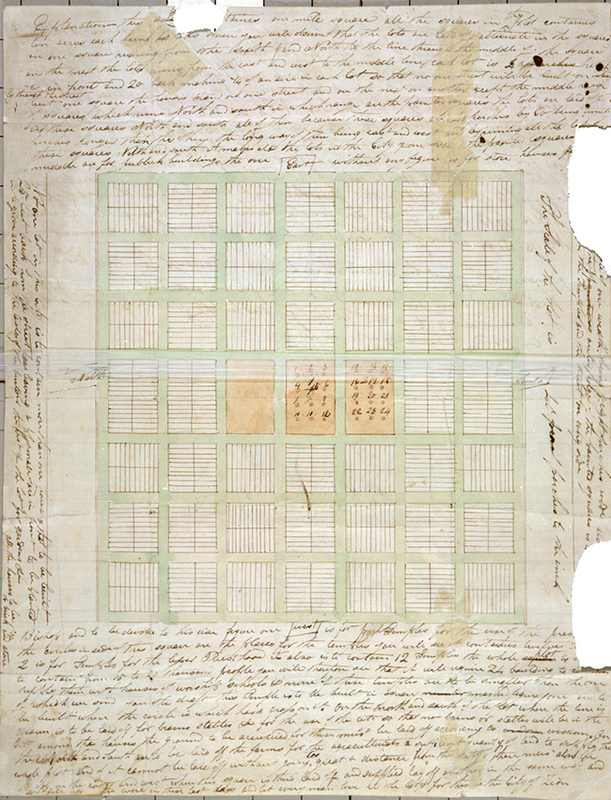 Where I find real relevance and personal application for New Jerusalem–the City of Zion–is in the plat (plan) that was created by Joseph Smith for the organization of the holy city (see History of the Church, Vol. 1 Chapter 26 [June 1833- July 1833]). This plat became the model for the early Saints as they built their first settlements. At the center of the original plat of Zion for New Jerusalem there were 24 temples! Everything in the planned city was to be built around and focused on the temple. To help understand the relevance of this in one’s life it is important to remember that the temple is a symbol of the Savior. So if I am patterning my life after the plat of Zion, I am not just creating a temple-centered life, but rather a temple-centered life is a Christ-centered life. 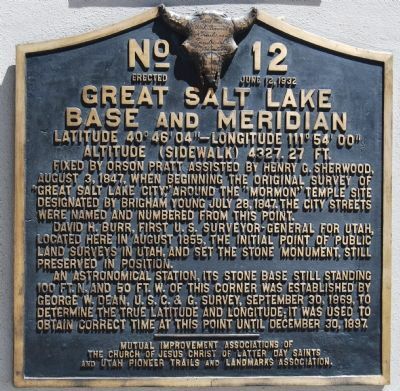 When the Mormon pioneers arrived in the Salt Lake Valley after their epic journey across the continent, and Brigham Young proclaimed that, “Here we will build a temple to our God,” in 1847, it was at this exact spot [Base & Meridian stone]. A stake was placed into the ground immediately and it became the anchor for the LDS headquarters and all of their activities thereafter. This same method also allows me to find my way to the temple by simply reversing the cardinal directions of most local addresses. If I am at Rice-Eccles Stadium, I am 4 blocks South and 14 blocks East of the Salt Lake City Temple, so the address is 451 South 1400 East, Salt Lake City. Once I know the address where I am , all I have to do is reverse the directions and I will arrive at the temple by traveling four-and-a-half blocks North and then 14 blocks West. In a Zion-like city, all roads lead to the Temple! Have you ever noticed what is on the cover of each of the booklets prepared for latter-day youth? 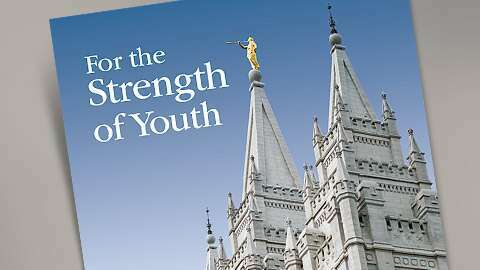 The temple is on the cover of the For the Strength of Youth, Personal Progress, and Duty to God booklets. Again, remember that the temple is a symbol of the Savior. ZION, the City of New Jerusalem, not only “sets forth an orderly pattern intended as an earthly reflection of the ideal religious community” (Far West Plat Reflects Inspired City Plan) but also a pattern for a Christ-centered lifestyle. THE SAVIOR IS AT THE CENTER! Those who will build their lives around the temple will find that they have centered their lives on the Savior. They will become citizens of New Jerusalem before it is even built, and they will receive the wages of the “laborer in Zion“. There is a simple symbol that is found in the Kirtland Temple that uses a similar theme to convey this same lesson of Savior-centered living. The concentric squares that are found on the interior decor of the arched windows of the Kirtland Temple are a simple and significant symbol that are said to represent sacred space with increasing zones of holiness. The squares represent the temple as a sanctuary from the world with areas in the temple being holier and holier, similar to the ancient temple’s outer court, Holy Place, and Holy of Holies. The following diagram of the layout of the Tabernacle of the Congregation is a good illustration of this. A video explaining the Tabernacle and its importance. Even the order of the Camp of Israel in the wilderness is an illustration of this symbol of sacred space with it’s increasing zones of holiness. The Tabernacle was at the center of the camp and was surrounded by the priesthood-bearing Levites, and the Levites were surrounded by the other Tribes of Israel. These simple squares that symbolize sacred space should also represent our lives and serve as a pattern of priorities for this life. I invite you to discover how this symbol of concentric squares can help you to improve your life by placing Christ at the center. Elder Dallin H. Oaks gave a talk entitled, “Good, Better, Best” that may be helpful for you to study and how each of the three concentric squares can represent those things in your life that are, “good, better, best” and ponder how to prioritized the the many aspect of your life using this pattern of the plat of Zion. If New Jerusalem is a pattern for you, then what do you need to do to become “NEW”? Most of us have more things expected of us than we can possibly do. As breadwinners, as parents, as Church workers and members, we face many choices on what we will do with our time and other resources. We should begin by recognizing the reality that just because something is good is not a sufficient reason for doing it. The number of good things we can do far exceeds the time available to accomplish them. Some things are better than good, and these are the things that should command priority attention in our lives. 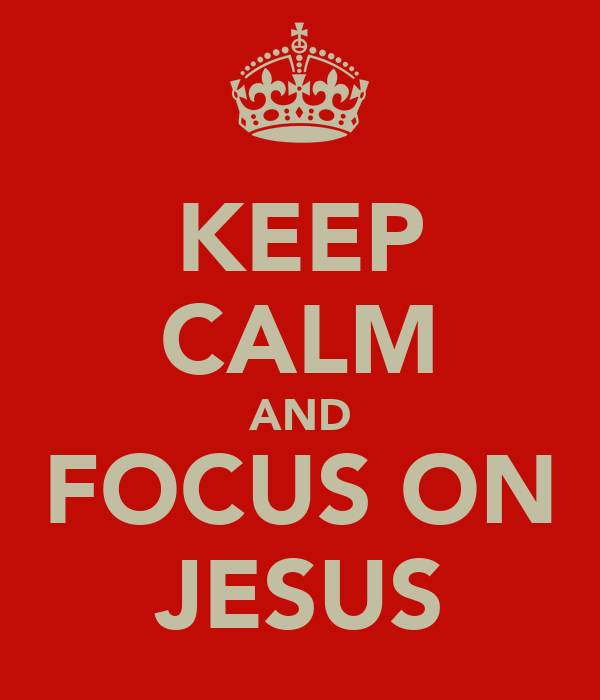 Jesus taught this principle in the home of Martha. While she was “cumbered about much serving” (Luke 10:40), her sister, Mary, “sat at Jesus’ feet, and heard his word” (v. 39). When Martha complained that her sister had left her to serve alone, Jesus commended Martha for what she was doing (v. 41) but taught her that “one thing is needful: and Mary hath chosen that good part, which shall not be taken away from her” (v. 42). It was praiseworthy for Martha to be “careful and troubled about many things” (v. 41), but learning the gospel from the Master Teacher was more “needful.” The scriptures contain other teachings that some things are more blessed than others (see Acts 20:35; Alma 32:14–15). A childhood experience introduced me to the idea that some choices are good but others are better. I lived for two years on a farm. We rarely went to town. Our Christmas shopping was done in the Sears, Roebuck catalog. I spent hours poring over its pages. For the rural families of that day, catalog pages were like the shopping mall or the Internet of our time. Consider how we use our time in the choices we make in viewing television, playing video games, surfing the Internet, or reading books or magazines. Of course it is good to view wholesome entertainment or to obtain interesting information. But not everything of that sort is worth the portion of our life we give to obtain it. Some things are better, and others are best. When the Lord told us to seek learning, He said, “Seek ye out of the best books words of wisdom” (D&C 88:118; emphasis added). In choosing how we spend time as a family, we should be careful not to exhaust our available time on things that are merely good and leave little time for that which is better or best. A friend took his young family on a series of summer vacation trips, including visits to memorable historic sites. At the end of the summer he asked his teenage son which of these good summer activities he enjoyed most. The father learned from the reply, and so did those he told of it. “The thing I liked best this summer,” the boy replied, “was the night you and I laid on the lawn and looked at the stars and talked.” Super family activities may be good for children, but they are not always better than one-on-one time with a loving parent. The amount of children-and-parent time absorbed in the good activities of private lessons, team sports, and other school and club activities also needs to be carefully regulated. Otherwise, children will be overscheduled, and parents will be frazzled and frustrated. Parents should act to preserve time for family prayer, family scripture study, family home evening, and the other precious togetherness and individual one-on-one time that binds a family together and fixes children’s values on things of eternal worth. Parents should teach gospel priorities through what they do with their children. The number of those who report that their “whole family usually eats dinner together” has declined 33 percent. This is most concerning because the time a family spends together “eating meals at home [is] the strongest predictor of children’s academic achievement and psychological adjustment.”3 Family mealtimes have also been shown to be a strong bulwark against children’s smoking, drinking, or using drugs.4 There is inspired wisdom in this advice to parents: what your children really want for dinner is you. Church leaders should be aware that Church meetings and activities can become too complex and burdensome if a ward or a stake tries to have the membership do everything that is good and possible in our numerous Church programs. Priorities are needed there also. But here is a caution for families. Suppose Church leaders reduce the time required by Church meetings and activities in order to increase the time available for families to be together. This will not achieve its intended purpose unless individual family members—especially parents—vigorously act to increase family togetherness and one-on-one time. Team sports and technology toys like video games and the Internet are already winning away the time of our children and youth. Surfing the Internet is not better than serving the Lord or strengthening the family. Some young men and women are skipping Church youth activities or cutting family time in order to participate in soccer leagues or to pursue various entertainments. Some young people are amusing themselves to death—spiritual death. Some uses of individual and family time are better, and others are best. We have to forego some good things in order to choose others that are better or best because they develop faith in the Lord Jesus Christ and strengthen our families. It is good to belong to our Father in Heaven’s true Church and to keep all of His commandments and fulfill all of our duties. But if this is to qualify as “best,” it should be done with love and without arrogance. We should, as we sing in a great hymn, “crown [our] good with brotherhood,”9 showing love and concern for all whom our lives affect. To our hundreds of thousands of home teachers and visiting teachers, I suggest that it is good to visit our assigned families; it is better to have a brief visit in which we teach doctrine and principle; and it is best of all to make a difference in the lives of some of those we visit. That same challenge applies to the many meetings we hold—good to hold a meeting, better to teach a principle, but best to actually improve lives as a result of the meeting. As we approach 2008 and a new course of study in our Melchizedek Priesthood quorums and Relief Societies, I renew our caution about how we use the Teachings of Presidents of the Church manuals. Many years of inspired work have produced our 2008 volume of the teachings of Joseph Smith, the founding prophet of this dispensation. This is a landmark among Church books. In the past, some teachers have given a chapter of the Teachings manuals no more than a brief mention and then substituted a lesson of their own choice. It may have been a good lesson, but this is not an acceptable practice. A gospel teacher is called to teach the subject specified from the inspired materials provided. The best thing a teacher can do with Teachings: Joseph Smith is to select and quote from the words of the Prophet on principles specially suited to the needs of class members and then direct a class discussion on how to apply those principles in the circumstances of their lives. I testify of our Heavenly Father, whose children we are and whose plan is designed to qualify us for “eternal life … the greatest of all the gifts of God” (D&C 14:7; see also D&C 76:51–59). I testify of Jesus Christ, whose Atonement makes it possible. And I testify that we are led by prophets, our President Gordon B. Hinckley and his counselors, in the name of Jesus Christ, amen. 1. Sears, Roebuck and Co. catalog, Fall and Winter 1944–45, 316E. 2. See Jared R. Anderson and William J. Doherty, “Democratic Community Initiatives: The Case of Overscheduled Children,” Family Relations, vol. 54 (Dec. 2005): 655. 3. Anderson and Doherty, Family Relations, 54:655. 4. See Nancy Gibbs, “The Magic of the Family Meal,” Time, June 12, 2006, 51–52; see also Sarah Jane Weaver, “Family Dinner,” Church News, Sept. 8, 2007, 5. 5. “Each a Better Person,” Liahona and Ensign, Nov. 2002, 100. 6. First Presidency letter, Feb. 11, 1999; printed in Church News, Feb. 27, 1999, 3. 7. “The Doctrinal Foundation of the Auxiliaries,” Worldwide Leadership Training Meeting, Jan. 10, 2004, 5, 7–8; see also Ensign, Aug. 2005, 62, 67. 8. “O Be Wise,” Liahona and Ensign, Nov. 2006, 18–20. 9. “America the Beautiful,” Hymns, no. 338. If what I have written has either confused your or left you wanting to learn more, then I would encourage you to review the following sites. They are some of my favorites (just a few of my favorites on this that have not been mentioned yet). Please feel free to leave a link to one of your favorites, or one that you feel is informative on this topic, in the comments section. The first thing we read after the separation of the righteous Nephites from the wicked Lamanites is a discourse by Jacob, the brother of Nephi (2 Nephi 6:1-3). What will be his text? Isaiah 49:22-52:2. What will be his purpose? To help us “learn and glorify the name of [our] God” (2 Nephi 6:4). Isaiah means “Jehovah Saves” (ישעיהו). His name in and of itself helps us to “learn and glorify” the name of God! But as Jacob points out, Isaiah’s name and words are not enough. His teachings must be “likened unto you” (2 Nephi 6:5). This is not the first time that Isaiah has been quoted in The Book of Mormon, nor will it be the last (see the post on “Isaiah for Dummies—Laman & Lemuel). It is also not the first time, nor the last, that a prophet will teach us that the words of Isaiah must be “likened” to us (1 Nephi 19:23). As you read these pages, seek to discover what Jacob and Isaiah share that will help you “learn and glorify the name of your God”. As Jacob points out in 2 Nephi 9:1, one of the things that will help you “learn and glorify the name of your God” is to learn from these pages “concerning the covenants of the Lord… with all the house of Israel”. He also expects that once we have finished studying these pages we will “rejoice, and lift up [our] heads forever” (2 Nephi 9:3). It seems like it is worth the time and effort to try and understand these teachings from Isaiah. One very important reason to pay the price for understanding these pages is because Jacob will use them as his springboard for 2 Nephi 9—one of the greatest doctrinal discourses on “the merciful plan of the great Creator” (2 Nephi 9:6) that I have found in scripture (I am excited for tomorrow’s read!). IF you watch this film about the last battle of Coriantumr and Shiz, you will notice a scriptural content error at the end. Understandably, it was most likely an intentional artistic edit to increase the drama of the already dramatic battle. The prophet Ether’s record of the Jaredite civilization serves as a witness that those who reject the Lord and His prophets will not prosper. These chapters are also a fulfillment of God’s decree that “whatsoever nation shall possess [the land of promise] shall serve God, or they shall be swept off” (Ether 2:9). However, what I would like to focus on in these chapters is great to learn about–NEW JERUSALEM (Ether 13:1-12). I love to learn and teach about New Jerusalem! Where I find real relevance and immediate personal application for New Jerusalem–the City of Zion–is in the plat that was created by Joseph Smith for the organization of the holy city (History of the Church, Vol. 1 Chapter 26 [June 1833- July 1833]). This plat became the model for the early Saints as they built their first settlements. At the center of the plat of Zion for New Jerusalem there are 24 temples! Everything in the city is built around and focused on the temple. To help understand the relevance of this in one’s life it is important to remember that the temple is a symbol of the Savior. So if I am patterning my life after the plat of Zion, I am not just creating a temple-centered life, but rather a temple-centered life is a Christ-centered life. This same method also allows me to find my way to the temple by simply reversing the cardinal directions of most local addresses. If I am at Rice-Eccles Stadium (451 S 1400 E, Salt Lake City), then I just need to travel four-and-a-half blocks North and then 14 blocks West and I will arrive at the Salt Lake temple. ZION, the City of New Jerusalem, not only “sets forth an orderly pattern intended as an earthly reflection of the ideal religious community” (Far West Plat Reflects Inspired City Plan) but also a pattern for a Christ-centered lifestyle. THE SAVIOR IS AT THE CENTER! Those who will build their lives around the temple will find that they have centered their lives on the Savior. They will become citizens of New Jerusalem before it is even built, and they will receive the wages of the “laborer in Zion“. ON THIS DAY IN 1844: 171 years ago today, the Prophet Joseph Smith, and his faithful and beloved brother, Hyrum Smith, were martyred at Carthage Jail. May we honor their lives by living our lives the BEST we can today! PRAISE TO THE MAN! Isaiah means “Jehovah Saves” (ישעיהו). His name in and of itself helps us to “learn and glorify” the name of God! But as Jacob points out, Isaiah’s name and words are not enough. His teachings must be “likened unto you” (2 Nephi 6:5). This is not the first time that Isaiah has been quoted in The Book of Mormon, nor will it be the last (see the post on “Isaiah for Dummies—Laman & Lemuel). It is also not the first time, nor the last, that a prophet will teach us that the words of Isaiah must be “likened” to us (1 Nephi 19:23). As you read these pages, discover what Jacob and Isaiah share that will help you “learn and glorify the name of your God”. Jacob points out in 2 Nephi 9:1 that one of the things that will help you “learn and glorify the name of your God” is to learn from these pages “concerning the covenants of the Lord… with all the house of Israel”. He also expects that once we have finished studying these pages we will “rejoice, and lift up [our] heads forever” (2 Nephi 9:3). Seems like it is worth the time and effort to try and understand these pages. I have found a lot of help by using the following manuals and articles when I study Isaiah. I have hyperlinked these manuals to specific parts for today’s reading, but if you take time to explore the manuals more fully you will find much more helpful information that will help you understand Isaiah’s writings in the Book of Mormon. 2016 #BOMTC Isaiah Survivor Award! Post it proudly to your social media once you finish 2 Nephi 24. There is a lot of bad stuff that happens in Ether 13-15, and most of it is not very fun to read about. The prophet Ether told the Jaredite king, Coriantumr, that his people would be destroyed because of their wickedness, and he admonished Coriantumr and his people to repent. When they refused to repent, war and wickedness escalated for many years until the entire Jaredite nation was destroyed. Only Ether and Coriantumr survived to witness the fulfillment of Ether’s prophecy. This plat became the model for the early Saints as they built their early settlements. At the center of the plat of Zion for New Jerusalem there are 24 temples! Everything in the city is built around and focused on the temple. To help understand the relevance of this in one’s life it is important to remember that the temple is a symbol of the Savior. So if I am patterning my life after the plat of Zion, I am not just creating a temple-centered life, but rather a temple-centered life is a Christ-centered life. These simple squares that symbolize sacred space should also represent our lives and serve as a pattern of priorities for this life. I invite you to discover how this symbol of concentric squares can help you to improve your life by placing Christ at the center. Elder Dallin H. Oaks gave a talk entitled, “Good, Better, Best“. I also invite you to consider how each of the 3 concentric squares can represent those things in your life that are, “good, better, best” and ponder how to prioritized the the many aspect of your life using this pattern of the plat of Zion. If New Jerusalem is a pattern for you, then what do you need to do to become “NEW”?